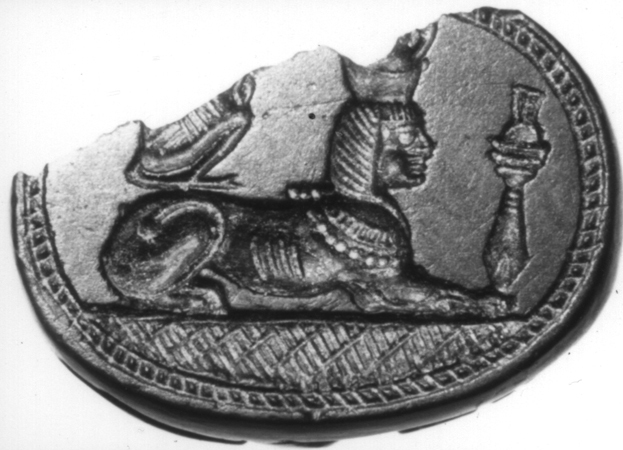 This is the more purely egyptianizing type. Almost all are recumbent. 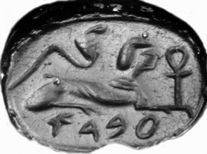 14/3 Busacchi Coll., from Tharros. Ebers, pl. 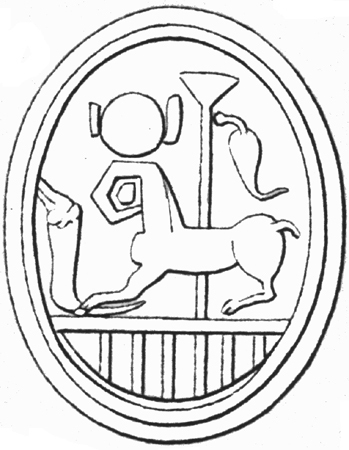 F 23; Hölbl, Sard no. 213. BH. 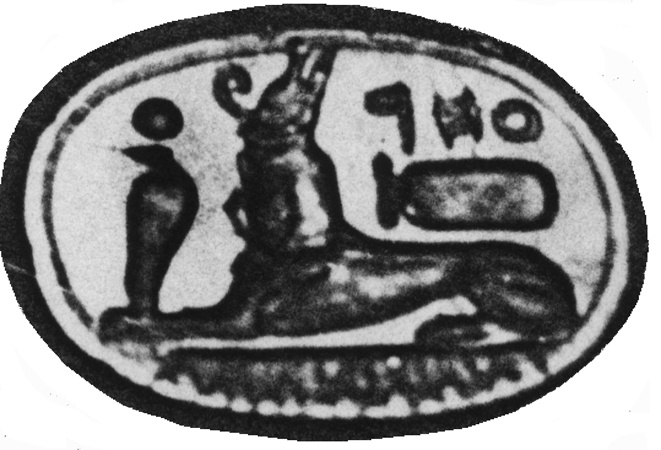 Seated sphinx, with apron, head turned back; on near side Horus, double crowned, apparently kneeling; lotus flower below. 14/4 Paris, Bibl.Nat., de Clercq no. 2589, pl. 17, from Marathus. Studies Quaegebeur (1998) 639, pl. 3.2 (Gubel). Scaraboid; BL;EXO. 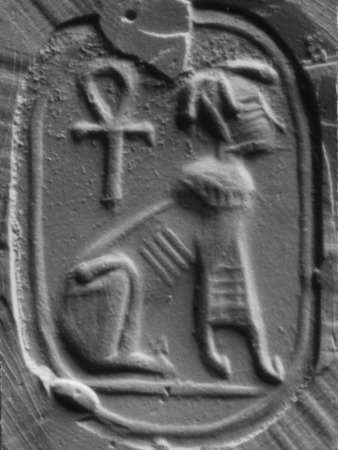 Seated, aproned, ankh behind. 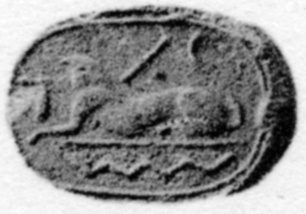 Probably Egyptian. 14/X1 Cagliari 9450, from Tharros. 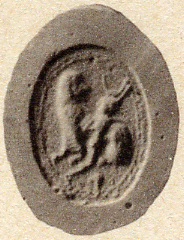 Chalcedony. Ebers, pl. H 86; Hölbl, Sard no. 207, pl. 155.2. 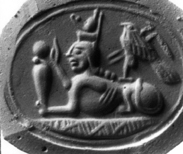 BL;EXCR; on gold hoop A. Double crown; disc-crowned uraeus in front; above, plain cartouche and Phoenician inscription, a name. 14/X2 Madrid, from Ibiza? Almagro-Gorbea, no. 265; Stud.Phoen. 9 (1992) pl. 2.6 (Gubel). White chalcedony. BL;EXCR. Recumbent, double-crowned, with one forepaw (human) raised in adoration behind a uraeus; on its back a hawk with crook and flail. 14/X3 London no. 288, pl. 6. Cornelian. BL. 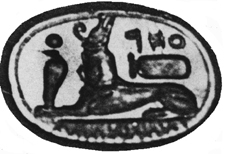 Double-crowned with uraeus in front, cartouche behind, winged disc above; in lower register lotuses and buds. 14/X4 London no. 379, pl. 7. Hölbl, Sard no. 209. Cornelian. BH; on gold hoop B. Double crown; hs vase before it; above, uzat and disc-and-crescent; over a lotus and buds.